Photograph by Doug Harding. Copyright Dean and Canons of Windsor. Sir Thomas Erpingham was one of eleven Knights who had received the Garter before the Battle of Agincourt took place; whilst a further fifteen knights who had served in the battle were appointed to the Order of the Garter after 1415. These KGs are listed below. The stall plates of eleven of these Knights can be seen in the Quire of St George’s Chapel although the remainder no longer survive, perhaps lost in the move from the original St George’s Chapel (on the site of present Albert Memorial Chapel) to the ‘new’ Chapel constructed by Edward IV from 1475. One of those still extant is that of Sir Thomas Erpingham [stall plate no. S17/14]. 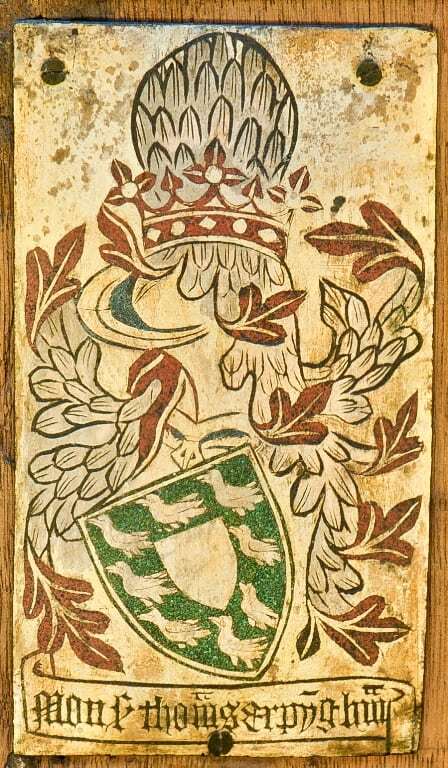 Thomas Erpingham, the son of Sir John Erpingham of Erpingham and Wickmere, Norfolk, was born in about 1355. As early as 1368, at the age of about thirteen, he is recorded accompanying his father on the military campaign in Aquitaine led by Edward, the Black Prince. By 1372 he had been knighted and had entered the company of William Ufford, Earl of Suffolk. He went on to serve John of Gaunt and Henry Bolingbroke, Earl of Derby, following Bolingbroke into exile in 1398 and playing a conspicuous role in his successful bid for the throne of England. In acknowledgement of his pivotal role in the defeat of Richard II, the newly crowned Henry IV promoted Erpingham as Chamberlain of the Royal Household, in addition to several other appointments including Constable of Dover Castle and Lord Warden of the Cinque Ports. In 1401, or thereabouts, the king appointed him to the Order of the Garter and he subsequently became a member of the Privy Council. Such appointments brought wealth and at the peak of his career, under Henry IV, his income from fees alone was reckoned at over £6,000 a year. On Henry V’s accession to the throne in 1413, he immediately appointed Erpingham as Steward of the Royal Household. Erpingham joined the king on his 1415 expedition to France and played a prominent part in the military campaign. He was present at the siege of Harfleur, where he acted as one of the negotiators in securing the surrender of the town, and at the Battle of Agincourt he was responsible for deploying the archers who played a decisive role in the English victory. He returned to France in 1416 where, as Steward of the Royal Household, he played a part in welcoming the Duke of Burgundy to Calais. However, in 1417 he resigned from the post of Steward and, although he occasionally attended council meetings, he seems to have retired from life at court. 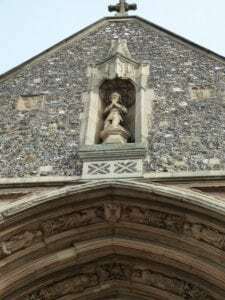 Erpingham died on 27 June 1428 and was buried in Norwich Cathedral as he had requested. He left many bequests to religious houses in East Anglia, financed the building of a west tower at Erpingham church and paid for the construction of a gate at the entrance to the cathedral precincts in Norwich known as the ‘Erpingham gate’. There follows a list of those Garter Knights believed to have been present at the Battle of Agincourt, with the year of their nomination or installation as members of the Order of the Garter as recorded by Peter Begent . However, it may not be a definitive list: secondary sources differ. Where stall plates survive, the stall plate references are given in square brackets.